How to deal with hazardous battery waste from solar power projects in developing countries? In order to achieve Sustainable Development Goal No. 7 on affordable and clean energy for all, many developing countries initiated ambitious energy access programmes that are often supported by the international donor community. Many of these government programmes follow a combined strategy encompassing grid extension, establishing mini-grids, as well as the distribution of solar home systems (SHS) and solar lanterns in remote rural areas with no connection to the electricity grid (off-grid). While energy-access projects undoubtedly have numerous positive development effects on newly electrified communities, they also bring new challenges related to waste management. These challenges are linked to the fact that equipment used for mini-grids and SHS, as well as the electrical and electronic devices powered by the new systems, will sooner or later become waste. And these waste types (commonly referred to as e-waste and battery waste) have more or less hazardous properties and require special treatment and disposal. E-waste and battery waste are already known to be a challenge in many developing countries and emerging economies with serious hot spots in many urban areas where collection and recycling is often conducted by informal sectors with little regard to emission control and impacts on human and environmental health. If these challenges are not taken into account by energy-access projects, related problems might soon expand to rural communities. But this negative scenario should not be used as a reason to slow down energy access efforts. In turn, it is known that many energy-access projects encompass much more than supplying equipment to off-grid areas and often also initiate transformative change in various 5 other fields of daily life and community interaction. Thus, energy-access projects can also serve as a pathway to introduce effective modern waste management systems in areas that have no or limited experience with complex municipal and hazardous waste. This paper aims to introduce the realities of managing e-waste and battery waste in the context of developing countries, with a specific focus on energy access projects. While chapter 2 gives an overview on the characteristics and required management pathways of most important e-waste fractions from off-grid power installations, chapters 3 to 5 specifically focus on the management of waste batteries from mini- grids and SHS. This focus is justified by the fact that batteries are typically the components with the shortest lifespan. Thus, it is the first waste fraction generated in large volumes only a few years after introducing mini-grids and SHS to a region. On top of this, waste batteries are associated with particularly pronounced environmental and health concerns so that this waste stream requires particular attention by energy-access projects and wider decision-making circles. Chapters 2-4: see publication (PDF). This chapter aims at giving recommendations and directions to project managers and practitioners involved in publicly or privately funded attempts to broaden access to electricity in off-grid areas of developing countries and emerging economies (here referred to as ‘energy-access projects’). Generally, there is an increasing consensus that energy-access projects and solar power companies can and should consider the above described issues around end-of-life management in their activities and try to implement strategies to mitigate negative effects while proactively contributing to sustainable solutions in this field. This viewpoint is mainly based on extended producer responsibility (EPR), which represents a globally accepted concept for products and waste streams posing significant risks to human health and the environment. In a nutshell, this concept says that economic operators placing such products onto the market carry responsibility for the sound end-of- life management of an equivalent amount of waste of such products. While in most developing countries there is no legal obligation covering this responsibility, it can also be regarded as ethical element for businesses that sell and distribute solar power equipment and accessories in developing countries and emerging economies. Already in 2014 the Global Off-Grid Lighting Association committed to have the Extended Producer Responsibility (EPR) principle as cornerstone for activities of their members (GOGLA 2014). At the same time, more and more investors of the solar power industry demand convincing strategies to address so far unresolved waste issues in business plans and implementation. Where public authorities or development cooperation institutions support the purchase of solar power equipment, they also have a responsibility to make sure that negative impacts from this equipment are avoided from a sustainability perspective. The following sections aim at supporting strategy development and decision making in this field and present various ways how this responsibility can be translated into practice. In most cases, the options presented below should be bundled and implemented in a coherent package. Practitioners working in energy-access projects are often involved directly or indirectly in procuring components and delivering these to their sites of use. The choice of battery types is an important project decision and end-of-life management should already be considered in such initial project phases. Chapter 3 (see publication) indicates that – despite their various differences – neither Li-ion batteries, nor lead-acid batteries are clearly superior in terms of end-of-life management as both battery types have characteristics that might lead to negative environmental impacts and/ or health and safety risks during use-phase, recycling and disposal. A comparative overview on these characteristics is given in Table 5/1. No developed formal e-waste and battery collection and recycling. E-waste is mostly handled by informal sector players that focus on valuable materials such as copper and aluminium. The related recycling processes are crude. There are few formal recycling companies that offer sound recycling of e-waste, in particular for businesses. There is one industrial lead smelter that focuses on the recycling of waste lead-acid batteries. The company recycles most end-of-life LABs of the country but is known to be highly polluting. The management is unwilling to improve recycling processes. The export of waste lead-acid batteries is restricted by law. The project supports the establishment of mini-grids in rural areas. Mini-grid equipment ownership is transferred to community organizations. Equipment maintenance is done by trained local engineers. Battery choice: From a project perspective, this situation favours the use of Li-ion batteries as there seems to be little chance to identify a sound solution for waste lead- acid batteries. In this context, the pollution risks from Li-ion batteries appear to be lower. At the same time, Li-ion batteries are not used at household level and equipment management is done by trained staff, which should widely mitigate safety risks. The project should consider partnering with a local responsible recycling company to develop a plan for battery and e-waste collection. In case lead-acid batteries are used in such a setting (e.g. for availability reasons), the project should consider awareness raising campaigns and training efforts for environmental authorities. The goal of such measures should be an increased regulatory pressure on the existing lead recycling industry to improve operations (also see section 5.3 and 5.4 of the publication). No developed formal e-waste and battery collection and recycling. E-waste is mostly handled by informal sector players that focus on valuable materials such as copper and aluminium. Informal recyclers also collect waste lead- acid batteries all across the country. The batteries are sold to a local company that needs the lead, plastics and acid for the production of new batteries. As this facility also has a demand for sulfuric acid, the system encourages the collection of wet batteries (with acid). Thus, uncontrolled acid drainage is uncommon. The applied recycling processes in this facility have undergone a qualified independent audit and can be considered to be environmentally sound. The project supports the distribution of solar home systems in rural areas. Due to low acceptance, business models such as pay-as-you-go are not applied. Thus, the equipment ownership is transferred to the users with the day of installation. Service and repairs are done by numerous local businesses that evolved over time and that have no tight connection to the project and its partners. In this situation, deep-cycle lead-acid batteries seem to be preferable over Li-ion batteries. This is because the project and its partners have very limited control over end-of-life batteries and cannot guarantee sound collection. In turn, there is already a market driven collection for waste lead-acid batteries in combination with a sound recycling facility. In addition, the use on a household level (solar home systems) requires ambitious safety standards. Although such standards can also be fulfilled with Li-ion batteries, lead-acid batteries are an established technology with very limited safety risks in the use phase. In case Li-ion batteries are used in such a setting (e.g. durability reasons), the batteries and the charge controller should be encased in a common housing as an effective barrier to user manipulations (see section 3.2.2 of the publication). Furthermore, it should be considered to introduce a collection system for batteries (and probably also other e-waste types), even if this is associated with additional costs. The goal of this measure should be to channel at least an equivalent amount of batteries and e-waste to sound recycling. The availability of a locally available and audited recycling process for the lead-acid batteries is an important factor for the battery choice in this case – feasibility scoping should assure that the audited facility is legitimate and operates in an environmentally sound manner. Where this is not the case, but where a local recycler is already quite close to international standards, the project may consider steps to assist this recycler in undertaking an audit and implementing necessary improvement steps to reach sound recycling processes. › Consideration on the battery types to be used in a project should already consider end-of-life management options and implications. › From end-of-life perspective, a general recommendation for or against a certain battery type cannot be given. Related decisions therefore need careful prior evaluation of local recycling and disposal options. A major means to reduce environmental impacts from hardware of energy access projects is product and system design. Setting quality and durability requirements that enable long battery and system life-times effectively reduces the amount of generated waste batteries and e-waste. At the same time, battery and system designs can help to reduce safety risks related to potential thermal runaways of batteries (see section 3.2.2 of the publication). While product designs can also reduce the amount of hazardous substances in products, this aspect is not elaborated in more detail in this report. This is because the battery choice as described in section 5.1 of the publication has by far the largest impact on hazardous materials in batteries and should be prioritized first. Compared to this, battery specific material compositions have a comparably low impact. A common means of ensuring long lifetimes and safe use conditions is the use of defined quality standards for systems and individual components. The following table gives an indicative overview on related standards. Generally, it is advised to combine ambitious requirements for systems with specific quality requirements for the battery type(s) used. One constraint might be the fact that many life cycle test methods for batteries are very time consuming, which might cause delays for projects and system distribution. In case such time consuming tests are considered to be unfeasible, batteries should at least fulfil the quality requirements of Lighting Global. Tests should be conducted according to the methods defined in the Solar Home System Kit Quality Standards or in IEC 62257-9-5. For Li-ion batteries used in SHS, it is also recommended to additionally apply a system design where charge controller and battery are encased in one common housing that cannot be opened with standard tools such as screwdrivers. 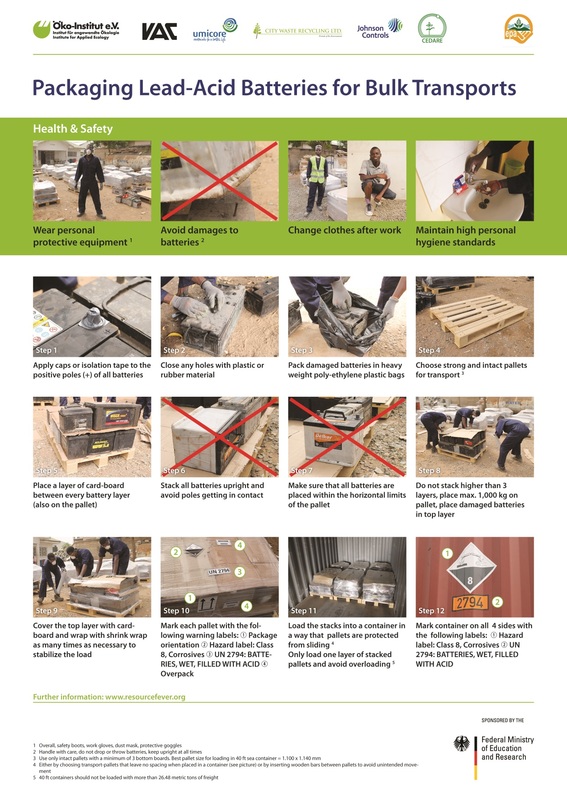 Appropriate warning signs should discourage any manipulation of the battery and the charge controller and should indicate associated risks such as electric shocks, fires and explosions. In addition, it is recommended that the type and chemistry of all batteries (e.g. LFP, LMO) are indicated on the housing. Testing provisions for SHS on a system level. IEC 61427-1: Secondary cells and batteries for renewable energy storage – General requirements and methods of test – Part 1: Photovoltaic off-grid application. Requirements and performance test methods for all types of secondary batteries. This norm refers to a number of (battery) chemistry- specific IEC norms (see below for exemplary selection). Specific requirements & testing provisions for stationary vented LABs. IEC 60896-21: Stationary lead-acid batteries – Part 21: Valve regulated types – Methods of test. Specific testing provisions for stationary val-ve-regulated LABs. IEC 61056-1: General purpose lead-acid batteries (valve-regulated types) – Part 1: General requirements, functional characteristics – Methods of test. Specific requirements & testing provisions for general purpose valve-regulated LABs. IEC 61960: Secondary cells and batteries containing alkaline or other non-acid electro-lytes – Secondary lithium cells and batteries for portable applications. Specific requirements & testing provisions for portable lithium cells and batteries. Specific requirements & testing provisions for industrial lithium cells and batteries. › When Li-ion batteries are used on a household level (solar home systems), system design should discourage any manipulation to the battery unit and the charge controller. › As indicated in section 3.1 of the publication, lead-acid batteries are already collected and recycled in many world regions because of their high, intrinsic economic value, which is relatively easy to exploit, also with rudimental and polluting recycling processes. In case a company mainly uses lead-acid batteries in its products, it should be considered to primarily focus efforts on improving the existing collection and recycling system rather than building-up parallel collection infrastructure. A generic model management chain for waste lead-acid batteries is given in Figure 5/ 1. Energy access projects may support improvements by working with solar power companies to build-up sound collection and by supporting national environmental authorities (also see section 5.4 of the publication). › In contrast, LMO and LFP batteries will not be collected based on existing market incentives because of their negative economic value (see section 3.2 of the publication). Thus, collection and recycling of such batteries will most likely require additional efforts that will be associated with additional costs. A generic management chain is given in Figure 5/2 (see publication). Here it needs to be noted that this chain represents one possible future option for managing waste Li-ion batteries in developing countries. › As indicated in chapter 4 of the publication, companies following business models that create strong and stable relationships with customers (PAYG) have some practical advantages for developing own collection systems. This is because they keep a stronger link with their existing customers so that they can use their service and repair personnel and infrastructure to collect obsolete equipment. For companies relying on external service support for customers, partnerships with such service providers might yield comparable results. › While some company initiatives try to focus collection on their own brand equipment, it should also be considered to accept waste batteries from other brands and sources. In general, such open collection efforts are considered to be more efficient and more likely to channel back significant waste volumes as volume is a key driver behind any waste management system. › As a general rule, a collection system should have a kind of volume-based target. Company based benchmarks should be derived from the amount of batteries and equipment brought onto the market in a defined time period or based on estimations of the waste being generated in the country. › In situations where good-willed companies are competing with an informal e-waste or lead-acid battery recycling chain, often a large volume of batteries are needed to make environmentally sound lead recycling viable. To achieve volumes, as well as to reduce costs, projects and companies might consider joining forces with other market players of the solar industry as well as with other industries bringing batteries into the market (e.g. automotive industry, mobile network providers). In many countries with mandatory EPR systems, companies established so-called Producer Responsibility Organizations (PROs) to jointly organize collection, recycling and a fair distribution of costs. › Apart from collection, it is of vital importance to identify sound recycling and disposal options for the collected batteries. While local recycling solutions should generally preferred, their environmental and health and safety related performance needs to be assessed carefully. This is particularly relevant for recyclers of lead-acid batteries, which should not be chosen without an independent environmental and health and safety assessment of all involved process steps. In case there is no suitable recycling partner within the country, the export of full batteries (including the acid) should be considered. › For Li-ion batteries recycling most likely requires exports to specialized plants (see section 3.2.3 and Figure 5/2 in the publication). Thus, sound management requires partnership with an experienced waste management and/or logistics company. In case no local company can be identified for this task, exports might also be organized via an international service provider such as Simpli Return. › Projects using lead-acid batteries should focus on improving existing recycling infrastructure and processes. In this context, links to the policy level should be explored (see section 5.4). › In the case that no suitable local management option for waste lead-acid batteries is in sight, exports to sound facilities should be considered. › Projects using Li-ion batteries should focus on piloting collection and recycling solutions. For collecting, synergies with distribution and maintenance networks can help to reduce efforts and costs. › Efforts and costs may also be minimized by cooperations with other projects and companies placing batteries onto the market. › Collection schemes should work with volume based targets. › In any case, projects should be aware that collection and sound recycling of Li-ion (LMO and LFP types) is associated with net costs. › EPR models where producers and importers have to pay into a central fund destined to finance sound collection and recycling, thus only retaining financial responsibility without having any control over operations. › Benchmark audits of all lead-acid battery recycling facilities of a country (in close cooperation with regulatory authorities). › Definition of improvement plans (in close cooperation with regulatory authorities). 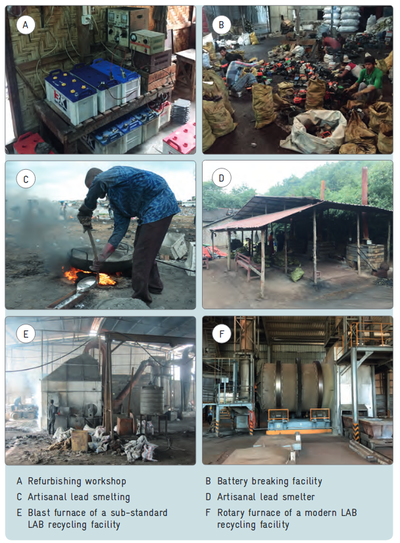 These activities were successfully conducted by the Sustainable Recycling Industries Programme (SRI) in Ghana and led to mandatory plant specific improvement plans that are tied to the factories’ operating licenses: In case a plant does not implement the plan as outlined, it will be sanctioned by the regulatory bodies, which can encompass fines and temporary or permanent shut-down of operations. This type of intervention does in most countries not require new laws or regulations as it can be based on general environmental regulations providing principles and emission limits for industry activities. In addition, this type of intervention is of high importance to achieve systematic improvements on a national level as sub-standard lead-acid battery recycling has economic advantages over high-standard recycling processes (see section 3.1.3 of the publication). Thus, stringent enforcement of standards is a key element to improve lead-acid battery recycling anywhere in the world. › Energy access projects and solar power companies should support the development of policies for sound management of battery waste and e-waste in their countries of activities. Related policies should follow the principle of Extended Producer Responsibility. › Policy development can be supported by leading by positive example. This may entail developing and implementing of sound collection and recycling solutions on a voluntary basis (also see section 5.3). › Regarding the management of waste lead-acid batteries, awareness raising and training activities for authorities, recyclers and other industry players can help increase national standards for lead recycling industries. ↑ GOGLA (2014). GOGLA Industry Opinion on Lifecycle and Recycling. Cologne. Available at https://www.gogla.org/sites/default/files/recource_docs/gogla-industry-opinion-on-lifecycle-and-recycling1.pdf, last accessed on 24 Jul 2018. ↑ Various countries have export restrictions on certain scrap types as a means to protect local recycling and manufacturing industries. ↑ Here it needs to be stressed that many sub-standard processes are in a condition where upgrading requires a fundamental change of the applied business model and will require multi-million investments in new equipment and remediation of the contaminated site. In such cases, this co-operative approach will most likely not yield satisfactory results and will require efforts from regulatory authorities (enforcing binding minimum standards). ↑ According to Lighting Global, batteries used in SHS can either be portable or stationary ones, depending on the size of the system. The specific standard(s) should be chosen accordingly. ↑ United Nations Environment Assembly (2017). Resolution on Eliminating Exposure to Lead Paint and Promoting Environmentally Sound Management of Waste Lead-Acid Batteries: UNEP/EA.3/L.24. Nairobi. Available at https://papersmart.unon.org/resolution/uploads/k1800228.english.pdf , last accessed on 14 Jun 2018. Batteries International. Making the economics of lithium disposal stack up – sensibly? Batteries International, pp. 52 – 58. Battery University (2018). BU-304a: Safety Concerns with Li-ion. Available at http://batteryuniversity.com/learn/article/safety_concerns_with_li_ion, last accessed on 15 Jan 2018. Chemistry Libre Texts 2018: https://bit.ly/2XqVkGb, last accessed 15.10.2018. Curry, C. (2017). Lithium-ion Battery Costs and Market. Available at https://data.bloomberglp.com/bnef/sites/14/2017/07/BNEF-Lithium-ion-battery-costs-and-market.pdf, last accessed on 10 Jan 2018. D’Adamo, I.; Miliacca, M. & Rosa, P. (2017). Economic Feasibility for Recycling of Waste Crystalline Silicon Photovoltaic Modules. International Journal of Photoenergy, 2017(6), pp. 1– 6. doi:10.1155/2017/4184676. Efficiency for Access Coalition (2017). Global LEAP Off-Grid Appliances Market Survey. Available at https://assets.publishing.service.gov.uk/media/5a38042fe5274a79051c9cea/Deliverable_4-2017_Off-Grid_Appliance_Survey_Summary.pdf, last accessed on 20 Jul 2018. EnBausa.de (2014). Brandgefahr auch bei Lithium-Eisenphosphat-Batterien. Available at https://www.enbausa.de/solarenergie/aktuelles/artikel/brandgefahr-auch-bei-lithium-eisenphosphat-batterien-3269.html, last accessed on 15 Jan 2018. GOGLA (2014). GOGLA Industry Opinion on Lifecycle and Recycling. Cologne. Available at https://www.gogla.org/sites/default/files/recource_docs/gogla-industry-opinion-on-lifecycle-and-recycling1.pdf, last accessed on 24 Jul 2018. GOGLA (2017). Providing Energy Access through Off-Grid Solar: Guidance for Governments. Utrecht. Available at https://www.gogla.org/sites/default/files/resource_docs/energy_access_through_ off-grid_solar_-_guidance_for_govts.pdf, last accessed on 19 Jul 2018. Green Cross & Pure Earth (2016). 2016 World‘s worst pollution problems. New York & Zürich. Available at http://www.worstpolluted.org/docs/WorldsWorst2016Spreads.pdf, last accessed on 29 Jan 2018. Harvey, J. (2017). Metal recyclers prepare for electric car revolution. Available at https://www.reuters.com/article/us-batteries-recycling-analysis/metal-recyclers-prepare-for-electric-car-revolution-idUSKBN1DH1DS, last accessed on 11 Jan 2018. Hietaniemi, M. (2015). Thermal stability of chemicals used in lithium-ion batteries: Master thesis at University of Oulu. Available at http://jultika.oulu.fi/files/nbnfioulu-201512032229.pdf , last accessed on 17 Jan 2018. IFC (2018): Off-Grid Solar Market Trends Report 2018. Washington. Available at: https://www.sun-connect-news.org/fileadmin/DATEIEN/Dateien/New/2018_Off_Grid_Solar_Market_Trends_Report_Full.pdf, last accessed on 27 September 2018. Kernbauer, S. & Hübner, T. (2013). Recycling von Photovoltaikmodulen. In K. J. Thomé-Kozmiensky & D. Goldmann (Eds. ), Recycling und Rohstoffe Band 6 (pp. 545–557). Neuruppin: TK Verlag. Kurzweil, P. & Dietlmeier, O. (2016). Elektrochemische Speicher: Superkondensatoren, Batterien, Elektrolyse-Wasserstoff, Rechtliche Grundlagen: Springer Fachmedien Wiesbaden. Available at https://books.google.de/books?id=gftSCwAAQBAJ. Magalini, F.; Sinha Khetriwal, D. & Munyambu, S. (2017). Cost-Benefit Analysis and Capacity Assessment for the Management of Electronic Waste (E-Waste) in the Off-Grid Renewable Energy Sector in Kenya. Available at https://assets.publishing.service.gov.uk/media/5aec1a5ee5274a702130def2/Cost-Benefit_Analysis_and_Capacity_Assessment_for_the_Management_of_Electronic_Waste__E-Waste__in_the_Off-Grid_Renewable_Energy_Sector_in_Kenya.pdf, last accessed on 19 Jul 2018. Mähliß, J. (2012). Gefährdungspotenzial von Li-Ionen-Zellen. Available at http://www.elektroniknet.de/elektronik/power/gefaehrdungspotenzial-von-li-ionen-zellen-92479.html , last accessed on 15 Jan 2018. Manhart, A.; Amera, T.; Kuepouo, G.; Mathai, D.; Mng‘anya, S. & Schleicher, T. (2016). The deadly business – Findings from the Lead Recycling Africa Project. Freiburg. Available at https://www.oeko.de/oekodoc/2549/2016-076-de.pdf, last accessed on 13 Jun 2018. Manhart, A.; Latt, K. & Hilbert, I. (2018). Report on the Fact Finding Mission on Management and Recycling of End-of-life Batteries used in Solar Home Systems in Myanmar. Freiburg & Yangon. Available at https://www.oeko.de/fileadmin/oekodoc/Batteries-from-SHS-Myanmar.pdf, last accessed on 14 Jun 2018. McCoach, H.; White, C. & Laundon, C. (2014). Techniques for Recovering Printed Circuit Boards (PCBs). Banbury. Available at for recovering printed circuit http://www.wrap.org.uk/sites/files/wrap/Techniques for recovering printed circuit boards, final.pdf, last accessed on 21 Jun 2018. Reuters (2018). Europe‘s first solar panel recycling plant opens in France. Available at http://news.trust.org/item/20180625164728-9luom/, last accessed on 29 Jun 2018. Sander, K.; Schilling, S.; Wambach, K.; Schlenker, S. Müller, A.; Springer, J.; Fouquet, D.; Jelitte, A.; Stryi-Hipp, G. & Chrometzka, T. (2007). Studie zur Entwicklung eins Rücknahme- und Verwertungssystem für photovoltaische Produkte. Hamburg. Available at http://epub.sub.uni-hamburg.de/epub/volltexte/2012/12655/pdf/Gesamtbericht_PVCycle_de.pdf, last accessed on 25 Jun 2018. Stahl, H.; Bauknecht, D.; Hermann, A.; Jenseit, W.; Jörissen, L. & Storr, U. (2016). Ableitung von Recycling- und Umweltanforderungen und Strategien zur Vermeidung von Versorgungsrisiken bei innovativen Energiespeichern. Dessau. Available at http://www.umweltbundesamt.de/publikationen/ableitung-von-recycling-umweltanforderungen, last accessed on 11 Dec 2017. Umicore (2018). Our battery recycling process. Available at http://csm.umicore.com/en/recycling/battery-recycling/our-recycling-process, last accessed on 14 Jun 2018. UNEP (ed.) (2011). Recycling rates of Metals: A Status Report. Paris. Available at http://www.unep.org/resourcepanel/Portals/24102/PDFs/Metals_Recycling_Rates_110412-1.pdf, last accessed on 12 Jul 2016. United Nations Environment Assembly (2017). Resolution on Eliminating Exposure to Lead Paint and Promoting Environmentally Sound Management of Waste Lead-Acid Batteries: UNEP/EA.3/L.24. Nairobi. Available at https://papersmart.unon.org/resolution/uploads/k1800228.english.pdf, last ac - cessed on 14 Jun 2018. USGS (2018). Mineral Industry Surveys - Lead in January 2018. Reston. Available at https://minerals.usgs.gov/minerals/pubs/commodity/lead/mis-201801-lead.pdf, last accessed on 13 Jun 2018. Weyhe, R. (2013). Recycling von Lithium-Ion-Batterien. In K. J. Thomé-Kozmiensky & D. Goldmann (Eds. ), Recycling und Rohstoffe Band 6 (pp. 505–525). Neuruppin: TK Verlag. This page was last modified on 26 February 2019, at 10:45.